The French had surrendered. The newly appointed French Prime Minister Philippe Pétain had broadcast that “with a broken heart” he requested Armistice on the previous night. In London there was considerable excitement over the news, and people everywhere were heard discussing it. Novelist George Orwell noted that there was such a rush on evening papers that he had to make four attempts before getting one. The immediate concern of the British cabinet was the fate of the French navy, of which there was no news yet. France possessed a large and modern fleet which was largely untouched by the hostilities. Falling into German hands could turn it into a mortally dangerous weapon against the Royal Navy. Churchill and the cabinet had been raising the issue with their French ally previously, in increasingly alarming tone. On a day before the armistice, the Cabinet directed a telegram “permitting” French to negotiate Armistice only in exchange for their fleet to be given away to Britain. If there were any opportunities for the agreement about the French fleet, they were now put to an end. That afternoon, Churchill delivered a speech to the House of Commons, broadcast on the radio to the nation – the third since the German attack on France started. The timing and the charisma were characteristic of his political genius. It was to become known as “Their finest hour” speech. 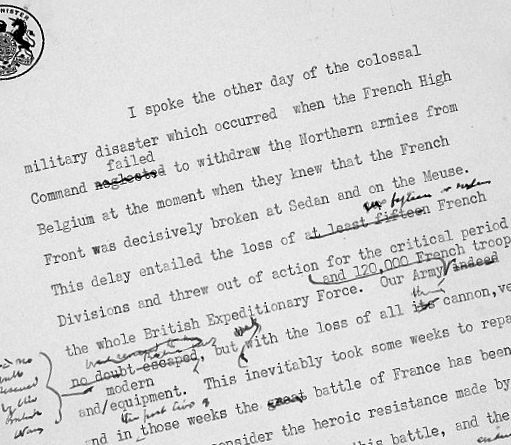 Closer analysis of the transcript of this long address reveals how badly Churchill needed to underline the strength, vigilance and reliability of the British forces to offset the psychological impact of the total collapse in France. Compared with the “We shall fight on the beaches” speech of 4 June, this speech is frequently resorting to pure propaganda: (“this (the Dunkirk – Ed.) loss inevitably took some weeks (sic) to repair”, “we sent every man we could to France as fast as we could re-equip and transport their formations.”, or “we have in this island today a very large and powerful military force”). The outline of the speech existed already during the previous day; it could have affected Churchill’s decision to suppress the news on the horrific Lancastria disaster off Saint Nazaire which had just occurred. Instead of mentioning further setbacks, he needed to reassure that “during the last few days we have successfully brought off the great majority of the troops we had on the lines of communication in France”. “I spoke the other day of the colossal military disaster which occurred when the French High Command failed to withdraw the Northern Armies from Belgium at the moment when they knew that the French front was decisively broken at Sedan and on the Meuse. This delay entailed the loss of 15 or 16 French divisions and threw out of action for the critical period the whole of the British Expeditionary Force. Our Army and 120,000 French troops were indeed rescued by the British Navy from Dunkirk but only with the loss of their cannon, vehicles and modern equipment. This loss inevitably took some weeks to repair, and in the first two of those weeks the battle in France has been lost. When we consider the heroic resistance made by the French Army against heavy odds in this battle, the enormous losses inflicted upon the enemy and the evident exhaustion of the enemy, it may well be thought that these 25 divisions of the best trained and best equipped troops might have turned the scale. However, General Weygand had to fight without them. Only three British divisions or their equivalent were able to stand in the line with their French comrades. They have suffered severely, but they have fought well. We sent every man we could to France as fast as we could re-equip and transport their formations. I am not reciting these facts for the purpose of recrimination. That, I judge, to be utterly futile and even harmful. We cannot afford it. I recite them in order to explain why it was we did not have, as we could have had, between 12 and 14 British divisions fighting in the line in this great battle instead of only three. Now I put all this aside. I put it on the shelf, from which the historians, when they have time, will select their documents to tell their stories. We have to think of the future and not of the past. This also applies in a small way to our own affairs at home. There are many who would hold an inquest in the House of Commons on the conduct of the Governments – and of Parliaments, for they are in it, too – during the years which led up to this catastrophe. They seek to indict those who were responsible for the guidance of our affairs. This also would be a foolish and pernicious process. There are too many in it. Let each man search his conscience and search his speeches. I frequently search mine. Of this I am quite sure, that if we open a quarrel between the past and the present, we shall find that we have lost the future. Therefore, I cannot accept the drawing of any distinctions between Members of the present Government. It was formed at a moment of crisis in order to unite all the parties and all sections of opinion. It has received the almost unanimous support of both Houses of Parliament. Its Members are going to stand together, and, subject to the authority of the House of Commons, we are going to govern the country and fight the war. It is absolutely necessary at a time like this that every Minister who tries each day to do his duty shall be respected, and their subordinates must know that their chiefs are not threatened men, men who are here today and gone tomorrow, but that their directions must be punctually and faithfully obeyed. Without this concentrated power we cannot face what lies before us. I should not think it would be very advantageous for the House to prolong this Debate this afternoon under conditions of public stress. Many facts are not clear that will be clear in a short time. We are to have a Secret Session on Thursday, and I should think that would be a better opportunity for the many earnest expressions of opinion which Members will desire to make and for the House to discuss vital matters, as I have said before, without having everything read the next morning by our dangerous foes. The military events which have happened during the past fortnight have not come to me with any sense of surprise. Indeed, I indicated a fortnight ago as clearly as I could to the House that the worst possibilities were open, and I made it perfectly clear then that whatever happened in France would make no difference to the resolve of Britain and the British Empire to fight on, “if necessary for years, if necessary alone.” During the last few days we have successfully brought off the great majority of the troops we had on the lines of communication in France – a very large number, scores of thousands – and seven-eighths of the troops we have sent to France since the beginning of the war, that is to say, about 350,000 out of 400,000 men, are safely back in this country. Others are still fighting with the French, and fighting with considerable success in their local encounters with the enemy. We have also brought back a great mass of stores, rifles and munitions of all kinds which had been accumulated in France during the last nine months. We have, therefore, in this island today a very large and powerful military force. This force includes all our best trained and finest troops and includes scores of thousands of those who have already measured their quality against the Germans and found themselves at no disadvantage. We have under arms at the present time in this island over a million and a quarter men. Behind these we have the Local Defence Volunteers, numbering half a million, only a portion of whom, however, are yet armed with files or other firearms. We have incorporated into our Defence Forces every man for whom we have a weapon. We expect a very large addition to our weapons in the near future, and in preparation for this we intend to call up, drill and train further large numbers at once. Those who are not called up or employed upon the vast business of munitions production in all its branches – and it runs through every kind of grade – serve their country best by remaining at their ordinary work until they are required. We also have Dominions Armies here. The Canadians had actually landed in France but have now been safely withdrawn, much disappointed, but in perfect order, with all their artillery and equipment. These very high-class forces from the Dominions will now take part in the defence of the Mother Country. Lest the account which I have given of these very large forces should raise the question why they did not take part in the great battle in France, I must make it clear that, apart from the divisions training and organising at home, only 12 divisions were equipped to fight upon a scale which justified their being sent abroad. This was fully up to the number which the French had been led to expect would be available in France at the ninth month of the war. The rest of our forces at home have a fighting value for home 54 defence which will, of course, steadily increase every week that passes. Thus, the invasion of Great Britain would at this time require the transportation across the sea of hostile armies upon a very large scale and, after they had been so transported, they would have to be continually maintained with all the masses of munitions and supplies which are required for continuous battle, as continuous battle it would be. As an appendix, I’d like to point to an interesting commentary published in Daily Mail yesterday (and commented also in other press), showing Churchill’s handwritten notes to the speech.